We welcome you and your family to Infinity Gymnastics Club of El Paso. We know that you will find the environment in our gymnastics family to be beneficial to the overall development of your child. Our mission is to improve the physical capabilities of each student in a positive and safe learning environment. The coaches and trainers at Infinity Gymnastics Club are formally trained to teach the sport of gymnastics in El Paso and are certified by USA Gymnastics. IGC follows the guidelines set forth by the United States of America Gymnastics (USAG) and uses it to conduct proper instructional sessions. We also adhere to a high level of performance requirements for level promotions before allowing a gymnast to advance to higher levels. We feel that this is important for any organization to abide by in the gymnastics industry. 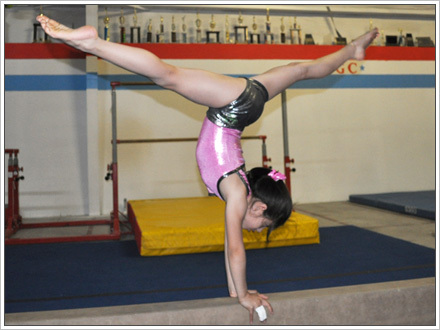 Infinity Gymnastics Club in El Paso is a gymnastics club for boys and girls of all ages. We have been a leader in gymnastics and tumbling education for El Paso since 2001. The IGC facility offers Olympic size equipment for teens as well as preschool size. Infinity Gymnastics Club has produced Oklahoma, Texas State Regional and National Champions. Our building is a newly remodled full-size training facility that features every modern version of equipment needed for competitve training in gymnastics, tumbling and cheer. All gymnasts are closely supervised by the owners, trainers and staff. If you're a serious athlete or just someone with a mild curiosity, we invite you to come discover what IGC has to offer. We give you the freedom to roam about the training area and practice whatever you want. Free tours of our facility! IGC welcomes you to come by and visit our gymnasium. We'll give you a complete tour of the entire IGC facility including the main gymnastics training area, tumbling area, circus days, offices, viewing areas, restrooms and parking. During your visit, if you decide that you might be interested in signing up, we'll register you for a free introductory class for tumbling, gymnastics or cheer,. it's your choice. Fill out a short form and send us your questions, comments and feedback. See our 2019 schedule here..
Sign up for our gymnastics newsletter and receive updates on upcoming events.